Meklit says her vocal style is influenced by the Ethiopian singers she grew up listening to. 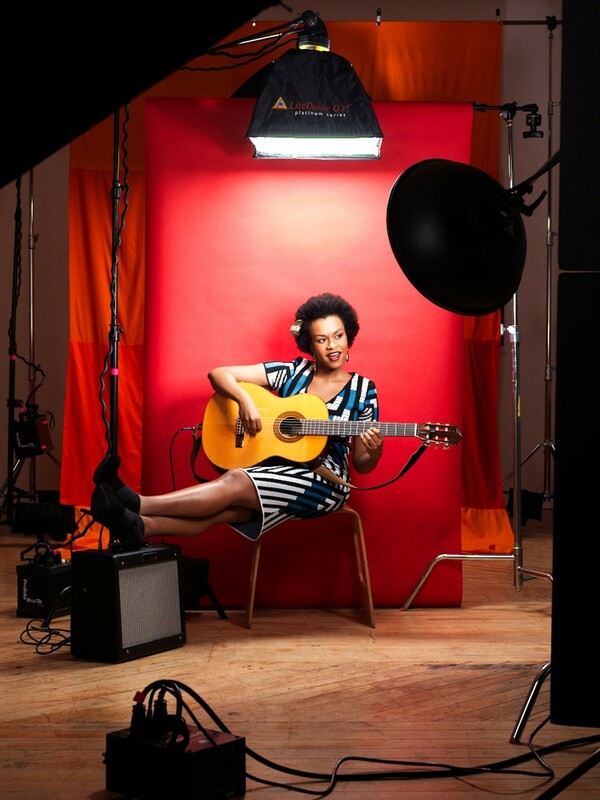 Meklit Hadero's singing voice has a fast-fluttering vibrato that's reminiscent of a cat's purr. Some have likened it to that of Eartha Kitt, the seductive 1950s chanteuse of "C'est Si Bon" and "Santa Baby" renown. Meklit (who recently stopped using her last name professionally) is flattered by the comparison, but she considers her tone to be more akin to those of the Ethiopian singers she heard as a child growing up in Brooklyn. 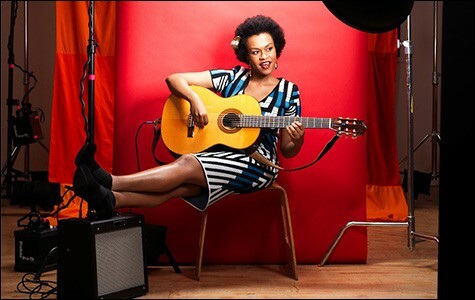 "I bring an influence of Ethiopia into everything I sing, whether it's in Amharic or English," the 33-year-old Addis Ababa-born singer, guitarist, and songwriter said over a dinner of pizza and gnocchi at a cafe just down the hill from her Bernal Heights home in San Francisco. "Another thing is that I'm really interested in expressing multiple tones," she added, naming veteran East Bay jazz and blues singer Faye Carol as one of her "vocal heroes." "She blows my mind every time I see her — not just her range sonically, but her capacity to express different tones is remarkable," Meklit said. "Another singer who is like that is Lila Downs. You have to be able to express very different types of sounds, to capture a kind of wide breadth of what you sing about. That's a goal of mine." Just a month ago, Meklit was performing in Uganda with The Nile Project, a multicultural ensemble of musicians from seven countries in the Nile River Basin. But she had to leave the group's month-long African tour after only two concerts in order to return to San Francisco to do photo and video shoots and rehearse with her three-man band for the release of her second solo album, We Are Alive, and a nine-city cross-country tour that stops at the Great American Music Hall on Wednesday. Meklit's mostly original music — she wrote all but two of the thirteen songs on the new CD — is breathtakingly eclectic. It reflects the influence of Ethiopian music — which she first heard on cassette after she and her physician parents moved to the United States when she was a year and a half — and Eighties radio favorites Michael Jackson, Prince, Tears for Fears, and U2, as well as early hip-hop, jazz, reggae, and various types of world music she was exposed to while studying political science at Yale. "In college, we used to have music-listening parties with people from all over the world," she said. "The whole thing was you'd bring two songs that you thought other people wouldn't have heard." She calls both herself and Six Degrees Records, the acclaimed San Francisco world-music label for which she now records, "in-betweeners." Her music is, in many ways, beyond categorization. "It is difficult for marketing because if you only have a sentence to talk about something, you have to simplify," she said. "I like to think of myself as a paragraph rather than a sentence. "I also think that that's how the world is going," she continued. "I feel like there are very few people who can confidently say that they only listen to one type of music. When you think about what an average person's iTunes [library] looks like, you're gonna have some world, some country, some rock, some inde-rock, some jazz, some folk, and it's gonna live comfortably through a person's different moods." We Are Alive was recorded over a period of seven days in November at New Improved Recording in Oakland by Eli Crews, a producer and engineer noted for his work with tUnE-yArDs, Deerhoof, Geography, ?uestlove, and Yoko Ono, among others. Meklit, who played acoustic guitar on most tracks, was accompanied by her working band — trumpeter Darren Johnson, drummer Lorca Hart, and bassist, keyboardist, and electric guitarist Sam Bevan — along with such guests as trombonist Adam Theis and violinist-violist Clio Tilton. Ethiopian piano virtuoso Samuel Yirga overdubbed his parts in Addis Ababa for "Kemekem (I Like Your Afro)" — the only tune Meklit sang in Amharic — but the basic tracks were largely recorded live to tape. Also present for some of the sessions was famed mystery novelist Walter Mosley, who Meklit has been friends with since they met over "bad bagels and weak coffee" four years ago while waiting to go on the air for the weekly radio program West Coast Live. Mosley wrote the notes for the CD booklet. Meklit said that Crews contributed greatly to the overall sound of We Are Alive. "He did some of the arrangements and made some textural choices for how the instruments are treated," she said. "As an engineer, he has such a capacity to capture the purest tones from the different instruments. You think, that's how a bass should sound or that's how a trumpet should sound. And he made a lot of choices in the mixing process. I feel this would be a totally different record without him." The singer played a toy piano on one of the tracks, a waltz titled "Stuck on the Moon" that has a European theatrical feel, much like some of the tunes from Bertolt Brecht and Kurt Weill's Three Penny Opera. She said the song came to her while she was walking with friends last summer on a rocky beach in Lecce, Italy. "Everybody was like, 'Wow! This is so lunar,'" she recalled. "We all felt like we were on another planet." On the lo-fi "In Rest," for which Meklit sang directly into an old-school telephone mouthpiece, she also did the background vocals, chirping do-da-do-da-do-da-do from Lou Reed's "Walk on the Wild Side" as a subtle tribute to the rocker, who had died the week of the recording. Rest is a recurring theme for the busy singer-songwriter, who divides her time between working on her own career and that of the multiethnic Nile Project, which she cofounded in 2011 with Egyptian ethnomusicologist Mina Girgis in order to help "create cultural relationships that are actually difficult to create within Africa," she said. Rest me from this logic world, she sings over the polyrhythmic grooves of "In Sleep." "I wrote that song out frustration, of feeling like logic was ruling my life, like the necessity to plan everything, to structure every day," she explained. "I was really overwhelmed with logistics. It was very tightening, but I found that I had relief from that in my own dreams. "Life is magical," she added. "The world is more expansive than we can imagine. We will continue to learn until the day we die. We will die one day, and that's okay. We're smack in the middle of a mystery. I don't mean that in a religious sense. It's just like, here we are and isn't it amazing?" That's the feeling she wanted to bring to the record. "That's why I called it We Are Alive," she said. "Life is so challenging. It's full of uncertainty, but we have to kinda step up to it. We dig ourselves in, we dig ourselves out, and the thing that keeps you going is this glowing reminder that we're alive."